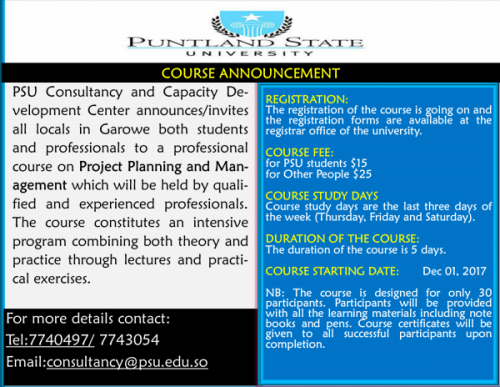 PSU Consultancy and Capacity Development Center announces/invites all locals in Garowe both students and professionals to a professional course on Project Planning and Management which will be held by qualified and experienced professionals. The course constitutes an intensive program combining both theory and practice through lectures and practical exercises. The registration of the course is going on and the registration forms are available at the registrar office of the university. Course study days are the last three days of the week (Thursday, Friday and Saturday). DURATION OF THE COURSE: The duration of the course is 5 days. NB: The course is designed for only 30 participants. Participants will be provided with all the learning materials including note books and pens. Course certificates will be given to all successful participants upon completion. Waxaa la ogaysiinayaa dhammaan bahda waxbarashada iyo xirfadlayda reer Garowe in Xarunta Tala-bixinta iyo Tababarada ee Puntland State University ay qabanayso tababar kusaabsan Project Planning and Management kaas oo ay qaban doonaan aqoonyahan leh khibrad dheer. Tababarka waxa uu noqon doonaa mid isugu jira theory iyo practical. Kasoo qaybgalayaasha waxaa lasiin doonaa dhammaan agabka waxbarasho iyo shahaado cadaynaysa cilmiga ay barteen ee Project Planning and Management. Tababarku waxa uu baxayaa Khamiis iyo Jimce.